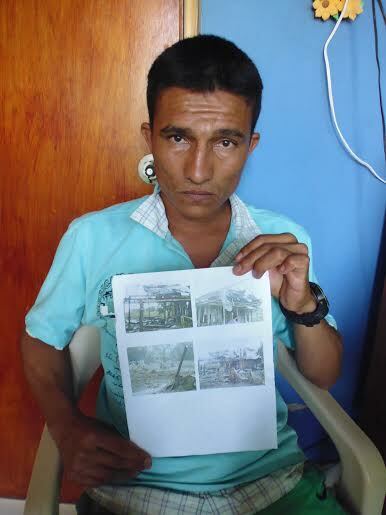 Giovanny Yamid Aldana holds a photo of his home, destroyed during a bombing by the Colombian Air Force on November 24, 2013. Photo by Dawn Paley.FORTUL, COLOMBIA — On Saturday, November 23rd, Giovanny Yamid Aldana left his humble family home in a rural area in the municipality of Fortul, to take his pregnant wife and son to the clinic. There, she took an ultrasound test, and the young family stayed over night in the city of Saravena, in the department of Arauca, near Colombia’s border with Venezuela. While media and government focus on the killings of guerrillas in the bombings, civilians who live in the area are sidelined and stigmatized as guerrilla supporters, regardless of the truth of the assertions. For his part Aldana says he has no connections with any of the armed groups operating in the area. “I could never have imagined something like this happening, because mine was a residence and I am well outside of the things that go on in the army and in the other armed group,” said Aldana, his hands trembling slightly as he spoke. Overnight, Giovanni Yamid Aldana, his wife and their eight year old son were transformed from small farmers subsisting off of their 10 hectare plot to three more among over 5.3 million people internally displaced by the armed conflict in Colombia. “I haven’t returned since it happened, because I’m afraid… I have no work, no money, my wife is pregnant, I have a son, and I don’t have a house to live in, my sustenance was there,” he said. According to Crisancho, the November 24th aerial bombing in Fortul was the second in the municipality in recent months, it came following a bombing on October 6th in a nature reserve not far from civilian housing. A third bombing on January 14, 2014 took place near rural houses in Fortul. Some victims of the bombings fear denouncing the events, while others do step forward and lodge formal complaints against the Army or other armed groups in the area. The hopes for compensation from the state are slim, as the process by which victims receive reparations from the state can drag on for years, if it is given at all. Most of the ariel bombings are never reported in the media, and it can be difficult to reach a total count of how many bombings are taking place in Colombia, according to Chrisancho. Fortul has historically been a conflict area, home to the Revolutionary Armed Forces of Colombia (FARC) and National Liberation Army (ELN) guerrilla groups, various paramilitary organizations, a large military base, and a special army battalion dedicated to protecting a recently constructed oil pipeline serving Occidental Petroleum and Canada’s Pacific Rubiales, among others. Recent bombings in Arauca are testament to the fact that there has been no ceasefire during the negotiations between members of the FARC and the Colombian government in Havana, Cuba. Dawn Paley is a freelance journalist who has been reporting from South America, Central America, and Mexico for over ten years. Her writing has been published in The Nation, The Guardian, Vancouver Sun, Globe and Mail, Ms. Magazine, The Tyee, Georgia Straight and NACLA, among others. Forget the debate about whether the personal is political: these stories annihilate the distinction altogether.